At 6:30 am twice a week, I pull on my compression tights, lace up my black and bubble gum blue boots, throw on a crumpled, old t-shirt, and join the early risers to play basketball at a local sports and aquatic centre. There is no crowd to cheer us on. The cold bites like a hungry, undead white walker from Game of Thrones, too. But for $4.20, it is my cheap-as-chips way to re-set my mind. My love of basketball has waxed and waned over the years. As a junior, I represented local clubs, and at 5’8” I was a short point guard. But I played with relish. The highlight of my ‘career’ was sinking a tricky, no-look basket against former Collingwood ruckman Damian Monkhorst in a losing grand final for my team in an outer suburban men’s competition. I was only eighteen, but after that loss I’d had enough of getting myself pumped up for the aggressive competition that came with weekly games. I quit the team without fully understanding the way basketball made me or others feel beyond winning. Sport, when it’s accessible and inclusive, sustains us. VicHealth research found that the social opportunities created through sport can be at least as important as its sense of competition. Philosopher Damon Young wrote in his book How to Think about Exercise that sport can encourage ‘flow’ states of mind that can make us feel free and timeless. These things make sense to me now when I step onto the wooden floors of the basketball courts. Today is like many others. To my right, a bunch of blokes in wheel chairs roll and bump across the painted lines of the key. Their well-muscled arms cannon the ball to the ring. On the court next to them, two young women practice shooting from the free throw line. They snap their wrists with precision and rarely miss. I join a group of older guys to play four-on-four. It’s a laid back game, but highly skilled. The ball flicks between flailing arms and legs as their wrinkled hands fire off deft passes. Our runners squeak and we grunt and guffaw when we miss shots. The grass roots grit of all these players is heartening. It is an enjoyable contrast to watching the high rolling basketball superstars on our screens. Of course, thinking too much is my nemesis on the court. I shoot, jittery, and the ball misses and makes an ugly thud against the ring. So I steady my hands and feet, and switch off my analytic mind. I focus on dribbling the ball, and the feeling of the dimpled leather in my hands. Its rise and fall is comforting. I square my feet and shoot again, smoothly. This time the ball swishes through the basket. When I play this way, I lose all sense of time and worry. My experiences are not unique. The CSIRO and the Australian Sports Commission identified six mega trends that will shape sport in Australia over the next 30 years. One of these is that ‘health, community and overseas aid objectives’ will drive participation in sport much more than competition. I agree, and I can see myself in their conclusions. But playing basketball before sunrise has also helped me realise that sport heals when I play it on my own terms. These terms shift and change over time. They are shaped – and not limited – by the competitive and commercial trends of 21st century life. This is where I negotiate what sport means to me, and make it part of my life. If only I’d known this all those years ago. For now, I am grateful that I can take out the rock and mix it up in the wee hours in my daggy shorts and with my half arsed hook shots. This makes me feel relaxed and happy. It is what I take with me into the long day of work ahead. Ben O'Mara is a health worker with a social science background. 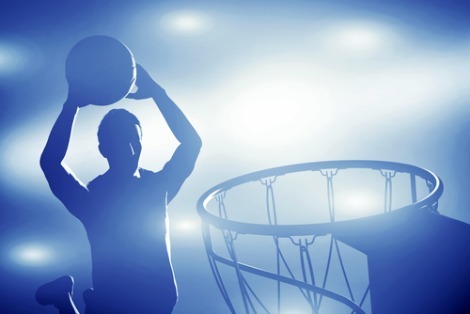 Basketball player image by Shutterstock. Recent articles by Ben O'Mara. Lovely to see some new words from Mr. O'Mara's always interwoven storytelling made up of aspects of his life and of ours. This links beautifully with the idea of the importance of play, as a purposeless activity - full of purpose. Fine stuff mate. Great article, Ben. Swimming is the sport that puts me 'in the zone'. I do laps at a heated pool (comfort first!) and like freestyle best, although I do like to challenge myself to get better at backstroke. Lately, I've had a bit of time away from swimming but am looking forward to getting back soon. My son is a passionate basketballer, playing in two comps during the week. Nice article Ben. You played basketball with great balance and poise and write pieces with great balance and poise. Spooky! I had to read the phrase "my black and bubble gum blue boots" three times to make sense of it. Nobody seems to use hyphens any more. I'd have written "my black and bubble-gum-blue boots", but then I'm getting old. Dan you're too kind - play as a concept is important, I reckon. It's great how it is flexible too. A sense of play can help and is possible across sport, narrative and everyday interactions etc. Pam thanks for reading! I need to do more swimming. It sounds like it has a similar 'flow' effect for you that basketball does for me. You'll enjoy being in the pool again. Dad I'm glad this was a good experience for you reading the story and it's testament to you coaching the team to the GF! Thanks Steph! I suspect my youthful poise has been replaced by rugged, mid 30s bang and crash drives to the basket. But I'm comfortable with my warts n' court presence! Michael apologies for the lack of hyphens. I agree, I reckon it works better with hyphens. I enjoy using them. Recently I've been feeling I use them too much. That may be why I wrote the sentence like that.